Four acres of land with significant development potential near Portland’s downtown could be available for sale by the end of the year, according to the city’s economic development director. 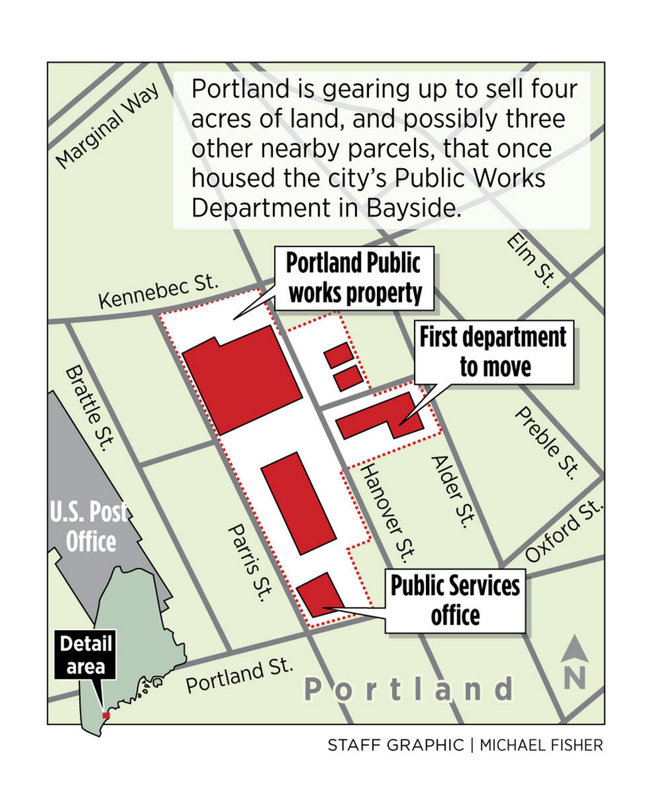 Greg Mitchell said city officials will likely choose a real estate broker in the coming weeks for land used by the city’s Public Works Department in Bayside, launching a process that could alter the course of one of Portland’s long-struggling neighborhoods. The only restrictions placed on the sale would be the current zoning, Mitchell said, and the city is open to selling all of the land to one buyer, or selling it by the parcel. Given the property’s location and zoning, which permits a wide range of uses, Mitchell expects that some sort of mixed-use development – including residential, office, retail and possibly a fitness center – could replace the current industrial-scale uses. Moving Public Works out of Bayside has been a goal of the city since the 1990s. After toying with potentially moving the department out to Riverside Street, among other options, the city in 2013 began securing a 13-acre site at 212 and 250 Canco Road, an industrial area in the geographic center of the city. Over the last year, the city focused more attention on the Bayside neighborhood, which is home to a multitude of social service groups, including the homeless shelters and soup kitchens. Last summer, the city directed more police attention to the area to deal with unruly behavior and made more of an effort to pick up litter, sweep the streets and rebuild sidewalks. It also has begun to rethink the way the city provides emergency food and shelter. Given that the “midtown” project, including more than 400 apartments, has stalled and is possibly being revised again, residents in Bayside hope that the city’s effort to sell and redevelop the public works properties will go more smoothly, said Bayside Neighborhood Association President Steve Hirshon. He noted that after five years of planning for the midtown development, no shovel has hit the ground. Hirshon suggested that residents are cautiously optimistic about the future. The estimated cost for relocating the Public Works Department is $15.5 million, with about $8.4 million already appropriated. On Monday, the City Council allocated $1 million from the recent sale of 3½ acres of land on Somerset Street to Federated Cos. for the midtown project toward upgrading facilities at Canco Road, leaving about $7 million in remaining costs. Mitchell said most of the public works operations, except for its fleet services at 44 Hanover St., have been moved to Canco Road. Administrative offices at 55 Portland St. will remain for now, but that building may be put on the market at a later date. Moving fleet services would require a new building at Canco Road, so that would not occur until funding is secured, either through a bond or using revenue from the sale of the land, or a combination. The city expects to open bids from potential real estate brokers Tuesday, Mitchell said. “I would expect we would make decisions quickly in hiring a broker,” he said. The city is looking to immediately list four properties and may list an additional three properties, all of which are scattered throughout the area generally bordered by Portland, Alder and Kennebec streets and Forest Avenue, according to a request for proposals for commercial real state brokers. The properties to be listed are 56 Parris St.; 82 Hanover St.-158 Kennebec St.; 65 Hanover St.-52 Alder St.; and 44 Hanover St. The properties are split between two business zones, which in some cases allow for 105-foot-tall buildings. Two parcels – a nearly 1.3-acre site at 82 Hanover St. and a nearly 1-acre site at 44 Hanover St. – could potentially be combined, according to the RFP, which also contemplates extending Somerset Street to Hanover Street and realigning Kennebec Street to Forest Avenue. Other properties, namely 55 Portland St., 178 Kennebec St., and 181 Forest Ave., may also be put up for sale. Mitchell said he suspects that existing brick buildings could be renovated and incorporated into any new development plan, while open lots and a metal shed at 44 Hanover St., which houses fleet services, could be remade from scratch. Mitchell declined to say how much he believed the city could get for the property, other than to say it could be a “significant” amount. He said the real estate market is strong, the property is close to downtown, and there is already development going on in Bayside, including the new Chipotle and Bangor Savings Bank locations on Marginal Way, the expansion of Bayside Bowl on Alder Street and the conversion of the Schlotterbeck & Foss building on Portland Street into market-rate housing consisting of a mix of 56 studio and one-bedroom apartments.